The moment you first see something so mean, you say a little prayer in your heart for the person being abused and pray, pray, and wish this is an isolated incident…but somewhere in your soul, you know it probably isn’t. I start to wonder if I live in a kindness bubble, and I know I do….BUT then something else rises in me- this work, this belief we hold so close around here- that Kindness Changes Everything. There is this drive to hold on to it closer than ever, to return it in an overwhelming expression, to find it in the places you would least expect it, to ask people to stand up tall in it. We have to make the connections for people that have suffered terribly as a result of extreme unkindness. We have to be and offer what we want to see in the world. We have to believe it is not only possible, but real and thriving….and bigger than anything else. 1. We created a I AM KIND Facebook page for kids, adults, all human beings to take a pledge of Kindness in honor of Karen and all those that have endured a similar experience. 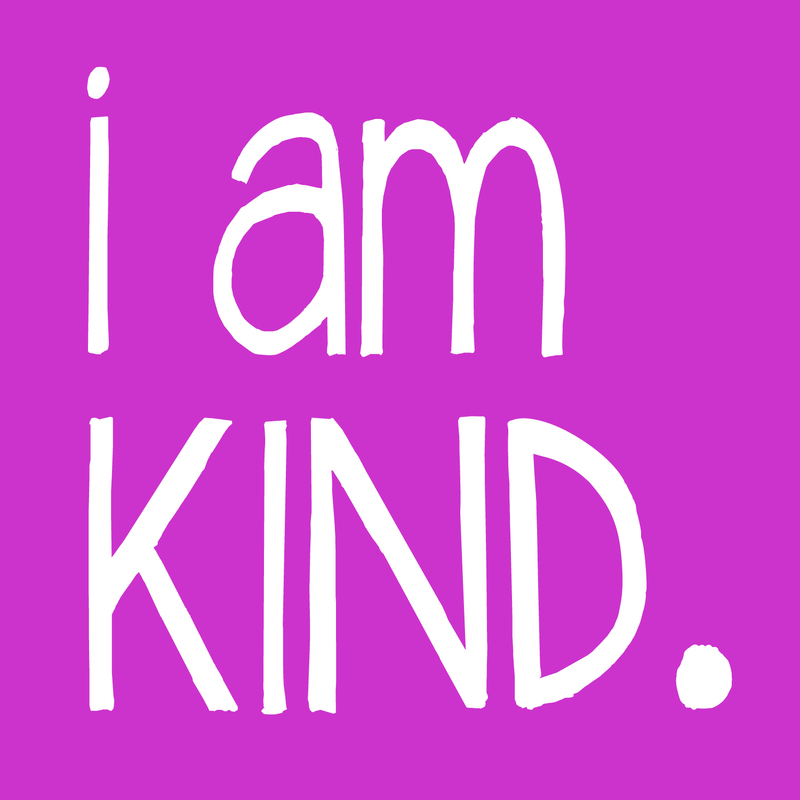 We are doing that by offering photos of us holding signs saying “I AM KIND.” Pictures in front of school buses would be especially awesome! You can upload all your pics to the Facebook page here. OR e-mail them to patience@kindnessgirl.com . 2. 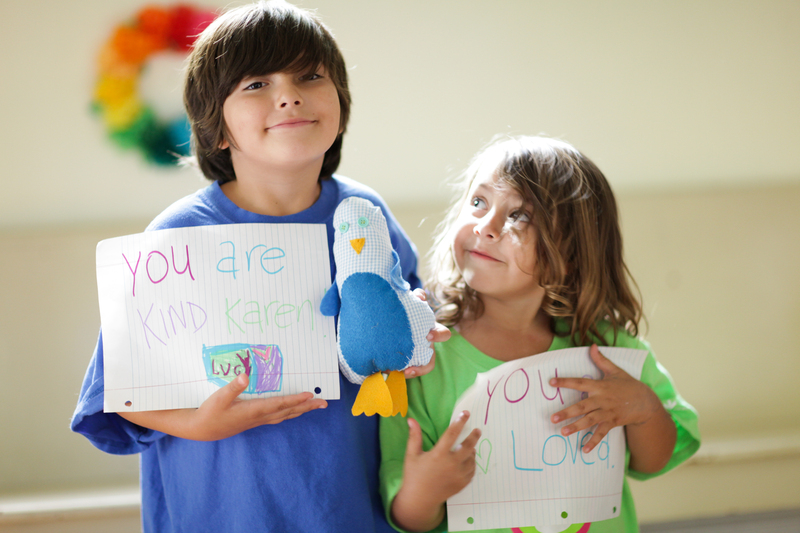 We are leaving notes and pictures with the words “You are LOVED” for Karen on the Facebook page too! 3. We still believe there is some kindness magic in Greece, NY and would love to send them some wands! Does anyone have a contact there or would be willing to hide some there for us? Let us know in the comments or e-mail me! Thank you all for holding the space for kindness today…and for returning it in critical times when the world and people really need to know it exists! Love to you all! If you can help spread the word of this project via Facebook or Twitter, that would be great! Ofcourse this video made me dreadfuly sad, but it also made me extremely curious. I think anyone, especially a child, has to be very unhappy for cruel acts to make them feel good. Why were those children so repeatedly cruel to this woman? Are they miserable? Do adolescents have some sort of natural proclivity towards Lord of the Flies bullying group think? I am flummoxed. I am not suprised. The level of violence in games, movies and tv affects how children think. It affects what they come to believe as normal or acceptable behavior. I do not belong to facebook. Is there some way to send a message to her directly through the news outlet?? I too was deeply saddened by this video, but as Linda mentioned, I am not surprised. This type of bullying to adults and other children is happening much too frequently and is being tolerated in schools when it shouldn’t be. I felt that the bus driver should have pulled over, got out her cell phone and called the school to have each of the kids picked up by their parents directly from the bus. There does need to be much more kindness in the world but there should also be an intolerance for bullying! This story broke my heart into pieces. I haven’t yet had the courage to watch the video. I’ll add my kindness to your new FB page as soon as I can. I can’t even fathom as to why these kids would have done such an awful thing to another person. Maybe being cruel is cheap and easy for some. Kindness takes more work and thought. You have to keep building those kindness muscles or they atrophy. Sending kindness to Karen & so many others who have been wounded by cruelty. I was bullied when I was a child, and I know first hand how much it hurts. I am new on my computer and haven’t yet figured out how to post a picture, but I will say with a happy heart ‘ I AM KIND!” I will have someone help me with my picture to post. Keep up the good work…kindness does change things.